Looking for the best yoga in Ubud, Bali? Ubud attracts yogis from around the globe and the local yoga market is saturated with yoga studios, retreats, resorts, and more. We help you find the best yoga in Ubud for your style and level of practice. If you are into yoga, you’ve no doubt dreamed about experiencing the legendary yoga scene in Bali. Or maybe you want to use your holiday to Bali to finally discover what yoga is all about? These days, doing a yoga retreat in Ubud or taking a yoga teacher training in Bali has become as common a yoga right-of-passage as a trip to India. But did you know that yoga in Ubud is fairly new? The studio that really kick-started yoga in Bali, The Yoga Barn, is only ten years old! The Yoga Barn is where it all began for yoga in Ubud. When The Yoga Barn Ubud opened in 2008, there were only a handful of places offering yoga in all of Bali. Ubud was primarily a farming village, not a tourist destination at all. Bali was a surf and beach destinations – landlocked Ubud didn’t have much to offer to ocean-loving tourists. But once Bali yoga took hold, tourism in Ubud began to grow (and grow and grow…)! Now, yoga in Bali – Ubud in particular – is big business and you can find more classes and types of yoga than you would in many big cities around the world. There are yoga classes in Ubud for every person, stye, and practice. 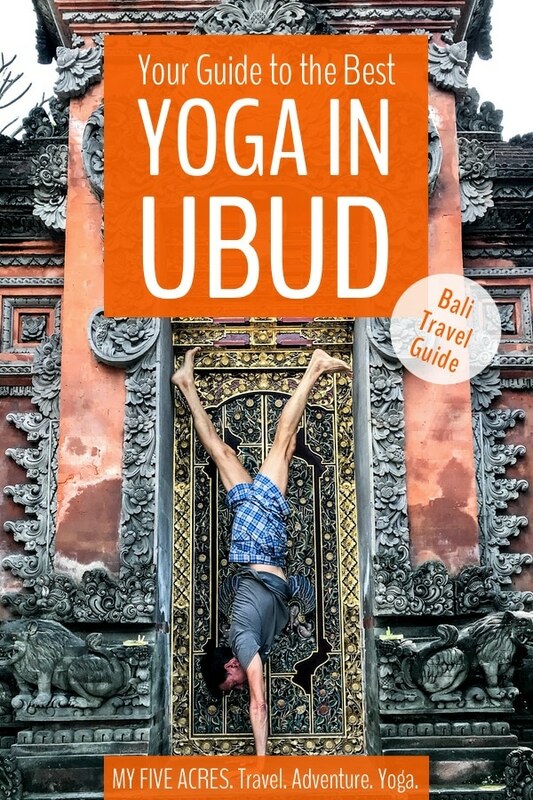 Sign up to get your free printable map and guide to the best yoga in Ubud. This guide also includes the best vegan & vegetarian, and healthy restaurants in Ubud. Chakra Yoga has an intimate space where they focus on yoga as a healing practice. An Ubud yoga studio dedicated to supporting Balinese yoga teachers, Chakra Yoga Shala is one of the few locally owned and staffed yoga studios in Ubud. At some other studios, local teachers are not paid the same rate as foreigners, and are not treated as well. Chakra offers you the opportunity to practice with Balinese yoga teachers and support their yoga journeys. Located in Banjar Penestanan Kaja, on the western side of Ubud, Chakra Yoga Shala is about 10 minutes from central Ubud on a scooter, but feels miles away from its hectic streets. The shala is open-air and there is a cool breeze from the corn and marigold field next door which gave me a welcome break from the sun! I took a Gentle Flow class with Devie, the founder of Chakra Yoga, an attentive and caring teacher who is passionate about yoga as a healing practice. Devie leads the Yoga Teacher Training at Chakra Yoga, and she is also a Chakra & Crystal Healer. She started her journey in yoga while she was recovering from serious illnesses. She has taught at several of the big Ubud and Canggu studios, but decided to open Chakra as a space to nurture and support Balinese teachers. One of the long-time studios in Ubud, Radiantly Alive is in the busy city centre, near Jalan Raya Ubud. They have several expat teachers who lead classes in various styles, as well as hosting workshops and teacher trainings. When I visited in July 2018 they were undergoing much-needed renovations and it was a bit of a big ol’ mess. I was told they expect the renovations to be done by the end of the year at the latest. If you visit, let us know how the work is progressing! I went to Jose Jimenez’s RA Vinyasa class and it was a big group, with a wide variety of experience. Jose was entertaining and offered us a challenging but fun practice. However, there wasn’t a lot of instruction for newer yogis in the form of alignment cues and modifications. As always, unless you have a lot of yoga experience, I recommend looking for Beginners or Level 1 classes where you’ll get the instruction you need to be safe and really enjoy class. My friend Mesi Toth teaches there and I highly recommend her classes. She was leading the Radiantly Alive 200-hour yoga teacher training when I was in town so she wasn’t leading public classes. But she likely will be when you’re in Ubud looking for yoga. So check out her classes! The Yoga Barn primarily has foreign teachers who come from all over the world to teach at this world-famous space. You can find just about any style to fit your practice there, (although when I visited in July 2018 I was sad to see they no longer had an Iyengar teacher on staff). They also host visiting teachers and have a few teacher trainings each year. Emily Kuser’s High Vibe 200-hour Yoga Teacher Training is held here each year and is one of the most popular yoga teacher trainings in Bali. The Garden Kafé here is amazing, so I recommend you make time for an XL glass of Lime Mint Slush and some food. Plus, if you’re looking for somewhere quiet to meditate or sit and read a book, there are lots of little benches and secluded corners dotted around the property. I attended Malika’s Level 2 vinyasa class when I visited The Yoga Barn and wow – what a mix of students! This class had people in it who had never done yoga before and people like me, who have done thousands of hours of yoga. Malika did a good job of managing the group and working to help everyone feel comfortable, but it’s very hard for any teacher to deliver a great experience to such a wide range of students. Because of its size and fame, I have found this to be a continuing problem at the Yoga Barn. If you’re new to yoga, please do yourself a favour and go to the Basics or Beginners classes on the schedule! If you have done a little more yoga, stick with Level 1. You will have a much more enjoyable experience and are far more likely to get your money’s worth. Fun fact: Whether through hearing it wrong or just misunderstanding the concept, lots of people think it’s The Yoga Burn Ubud. It’s not, though I’m surprised nobody has opened a rip-off studio with this name yet! I haven’t had a chance to visit these yoga studios in Ubud yet, but have heard through friends that they offer some of the best yoga. A big modern studio on the southern edge of town, the Ubud Yoga Centre has it all here when it comes to fitness. They host a wide variety of fitness and yoga classes and have only Balinese teachers – another chance to support the local fitness community. The studios are sleek, modern, fully enclosed by glass walls – it might be the only yoga studio in Ubud to have real walls! I stopped by the studio but sadly didn’t get a chance to take a class. The staff were very welcoming and helpful, so don’t be intimidated to visit if you’re new to yoga! They will happily answer all your questions. Bonus: The Ubud Yoga Centre is a short (and only slightly nerve-jangling) walk from our favourite vegan restaurant in Ubud – Sage. Though we have eaten at Moksa‘s excellent restaurant – one of our favourite vegan restaurants in Ubud – a couple of times, I haven’t joined a yoga practice there yet. Recently, they added a beautiful dojo – or practice space – to their property, where they offer capoeira, martial arts, and yoga classes taught by international and local teachers. The space is an airy wooden construction, open to the elements in traditional Balinese style mixed with a touch of Japanese dojo design. Intuitive Flow offers a warm and personal welcome into yoga. Penestanan is our new favourite part of Ubud. But don’t tell everyone or it will get too busy! Wandering its narrow pathways, you can imagine what Ubud must have been like before the mega tourist invasion. On one of these pathways, you’ll find Intuitive Flow. You know you have arrived when you see the giant statue of Patanjali under the multi-headed cobra-umbrella. They offer a mix of beginner classes, Gentle Flow, Restoratives, Meditation, Yin, Yoga Nidra, Hatha Vinyasa, Vinyasa Flow, and Pranala – a Balinese yoga. Though I didn’t get a chance to practice there, I met a woman on the fast boat from Nusa Penida to Bali who recommended their classes – she was travelling with a yoga mat so I took her recommendation more seriously than I might have otherwise. She especially liked their small class size which allowed for more personal attention than you get at the bigger studios in Ubud. 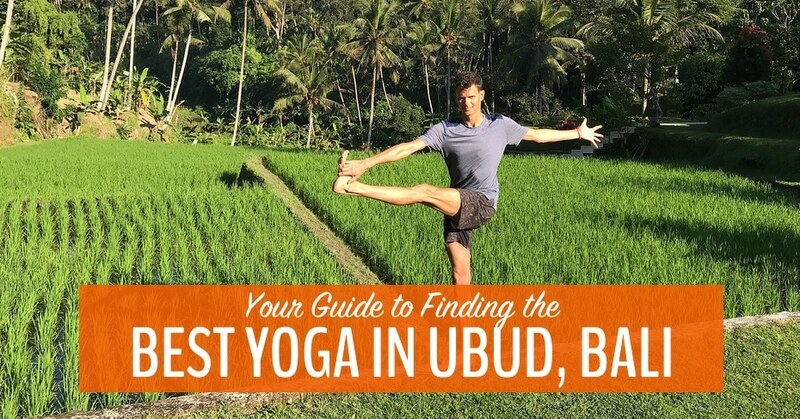 Sign up to get your free printable map and guide to the best yoga in Ubud. This guide also included the best vegan, vegetarian, and healthy restaurants in Ubud. Located in the peaceful village of Nyuh Kuning, close to the Monkey Forest, Taman Hati yoga will introduce you to something a bit different. Founded by I Ketut Bandiastra, he teaches his own style of yoga called Pranawayu, based on Kundalini, Iyengar, Ashtanga and Hatha Yoga. They also hold Kundalini classes daily, except Sunday. Primarily an Ashtanga studio, Usada also offers a weekly Hatha class and some Kundalini classes, as well a philosophy lectures, yoga workshops, and courses in permaculture farming and sustainable living. Usada is in central Ubud on Jalan Sugriwa, one block over from Jalan Hanoman. Yoga Saraswati in Ubud offer centrally-located, daily yoga with the cheapest prices for yoga in Ubud. Saraswati emphasizes beginner and gentle yoga, prioritizing self-expression and acceptance over mastering the final form of the poses. Morning Ashtanga practice only. Spacious Yoga offer a 6:30am Mysore practice Sunday through Thursday and on Friday a 7:00am Led Primary class. In the heart of Ubud, the sprawling Taksu property also houses a popular spa and restaurant. They hold daily yoga classes with a mix of Restorative, Hatha Flow, Thai Yoga Massage, Yin, Vinyasa, and beginner classes. Overlooking the rice terraces on the path to Sari Organik Restaurant, Ubud Yoga House opened in 2014. They hold daily classes offering yoga and meditation. According to their website, all classes are student-centred to meet the individual needs of beginners, intermediate, and advanced students. There are so many Ubud yoga retreats that you could spend months researching and choosing the perfect one. Here are a few that caught my eye! 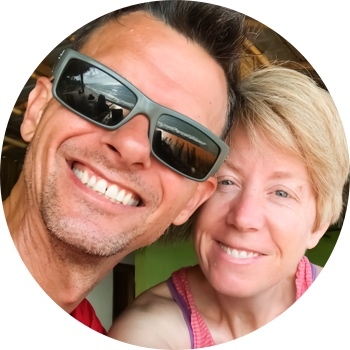 If you’re looking for a retreat that will help you heal your body and soul, or just make a shift towards a healthier lifestyle, take a look at this week-long raw food and yoga retreat. More than just yoga, this retreat includes personal coaching, inspiring talks, and a gourmet menu of raw food. Accommodation is in a private luxury villa with infinity pool overlooking the rice fields outside of Ubud. The master suite has a king size bed with a wrap-around terrace and the en-suite bathroom has a custom-made bathtub, hand carved from a giant tree. Sounds fantastic! If you want to really get away from it all and restore and renew your energy, this sound healing and yoga retreat could work wonders. The retreat includes daily Hatha yoga and sound healing sessions, plus a range of daily walks. Retreat to the fabulous Blue Karma resort for some quality “me” time. The accommodation at the highly rated Blue Karma is in luxury Indonesian Joglos arranged around a central pool and set amidst the gorgeous Balinese rice fields. If you want to combine a yoga retreat with the chance to see some of Ubud’s most enticing sights, check out this 7-day retreat. It includes a daily yoga session, plus trips to Bedugul Temple, Jatiluwih Rice Fields, Mount Batur, and a cycling tour. The accommodation for this affordable retreat is at Hotel Villa Ubud, a secluded property set amidst the rice fields not far from Ubud. There are plenty of other retreat styles, from super-budget retreats to ultra-luxury retreats, in Ubud. If you want to treat yourself to a luxury get-away with yoga on your doorstep, or you just want to design your own yoga retreat, stay at one of these beautiful resorts in Ubud that also offer yoga. Check with the individual resorts for their yoga schedules, prices, and teachers. They change too often for us to list them all here. Imagine practicing yoga here! You can, even if you’re not a guest of the resort. 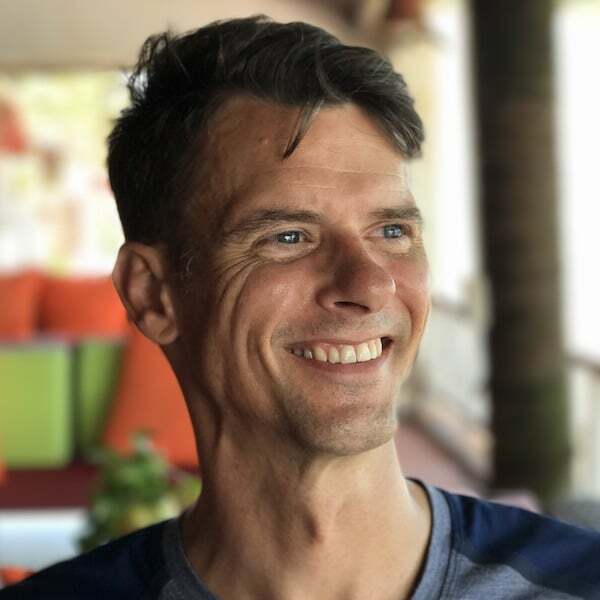 If you’re looking to splash out, I highly recommend the Four Seasons Resort in Ubud, where I taught in July and August 2018. If that doesn’t convince you, the Obamas stayed here when they visited Ubud in 2017, plus it was recently voted best hotel in the world by Travel + Leisure readers. Hot yoga tip: Even if you aren’t a guest at the Four Seasons, you are welcome to join the yoga practice – which happens in the most spectacular yoga shala I’ve ever seen! Just call the spa to book your spot. If you’re there in January, come practice with me! One of the other most highly rated luxury resorts in Ubud, Mandapa offers daily yoga and various mind-body connection packages for the wellness crowd. Create a do-it-yourself yoga retreat at COMO in Ubud. A stay at the highly-rated Purana in Ubud includes free yoga classes. 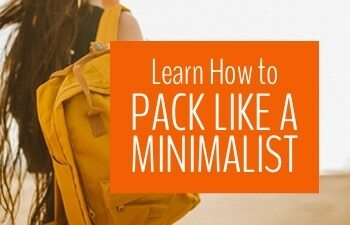 Pin for your mindful escape to Ubud. Tagged Asia, Bali, Indonesia, yoga travel. Here's your guide to the best restaurants in Sanur for vegetarians, vegans, and omnivore eaters too!